This raccoon femur shaft from Modoc Rock Shelter shows cut marks at both ends of the shaft. Archaic people may have made these cuts to separate the upper part of the back leg from the hip bone and the lower leg during butchering. Image taken by Bonnie Styles. Skinning, butchering, and cutting carcasses into smaller parts for food sharing and cooking all leave cut marks. We systematically record any marks or breakage that might be related to human removal of skins and preparation of animals for consumption. Most of the cut marks occur on the larger animals, such as white-tailed deer. However, we do find cut marks on smaller animals such as raccoon, muskrat, turkey, waterfowl, turtles, and fish. Cut marks are relatively rare at Koster and Modoc Rock Shelter, but bones are highly fragmented. As noted above, we think that Archaic Period people intentionally broke some bones to extract nutritious bone marrow. During the Archaic Period, people cooked animal foods in a variety of ways. 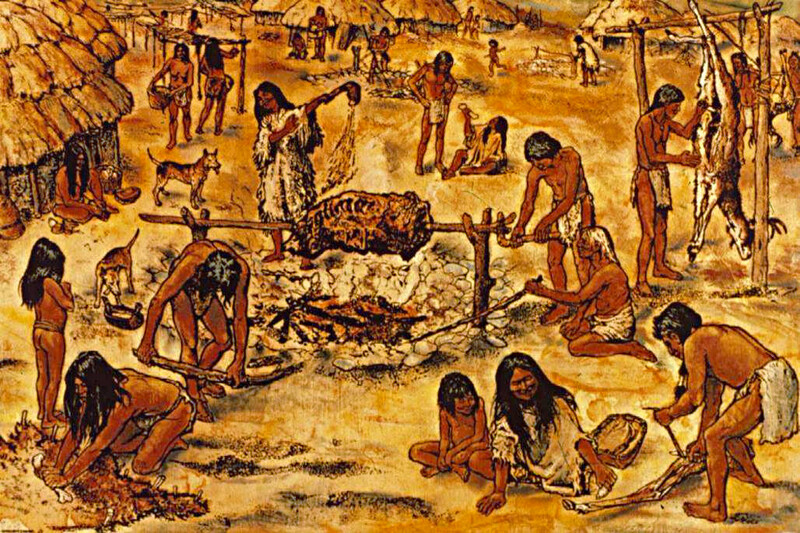 This painting of an Archaic base camp at the Koster site by George Armstrong shows roasting a butchered deer over an open hearth. We find abundant evidence for hearths at Koster and Modoc. Archaeologists also excavated pits at Koster that may have been used to steam mussels. We find bones, shells, and fire-cracked rocks scattered around the hearths and pits at Archaic sites. Image used with permission of Center for American Archeology. We look for and record evidence of cooking by examining conditions, burning patterns, and fragmentation of bones. Archaic Period people likely cooked animal foods using a variety of methods. We think that Archaic people heated rocks in hearths and placed them in pits along with water to cook foods. The foods may have been covered with layers of plants and perhaps sand. We find lots of fragments of burned and fire-cracked rock at Archaic sites. Accumulations of fire-cracked rocks, freshwater mussel shells, and burned plant remains around and in pits suggest that Archaic Period peoples steamed mussels at the Koster site. People may have also used skin bags for boiling and heating foods, but the bags would not have been preserved. As noted above, Archaic Period people may have broken marrow-rich bones into small pieces and then boiled them to extract the marrow and fat. Deer bones that would have contained marrow are highly fragmented at the Archaic period sites that we studied for our grant. During the Archaic Period, people likely roasted many foods over the open fire. Bones burned on both ends but not in the middle have provided evidence for roasting of sections of meat at sites in Ireland, but the burning patterns at Koster and Modoc were not that clear cut. At Modoc Rock Shelter some bones were burned to a red color. Preliminary experiments suggest that this type of burning might result from indirect heat. The reddening could result from hearths affecting buried bones, indirect heating of bones surrounded by meat, or even cooking partially buried pieces of meat with bones inside. If you have ever roasted a chicken in the oven, you know that the bones become discolored. These bones show burning intensity for a sample of bones from the 1984 excavations at Modoc Rock Shelter. The red-colored bones on the left are interpreted as being lightly burned. The black-colored bones in the center are charred (heavily burned), and the white and gray-colored bones on the right are calcined (most heavily burned). Image taken by Bonnie Styles. We record the intensity of burning of bones. 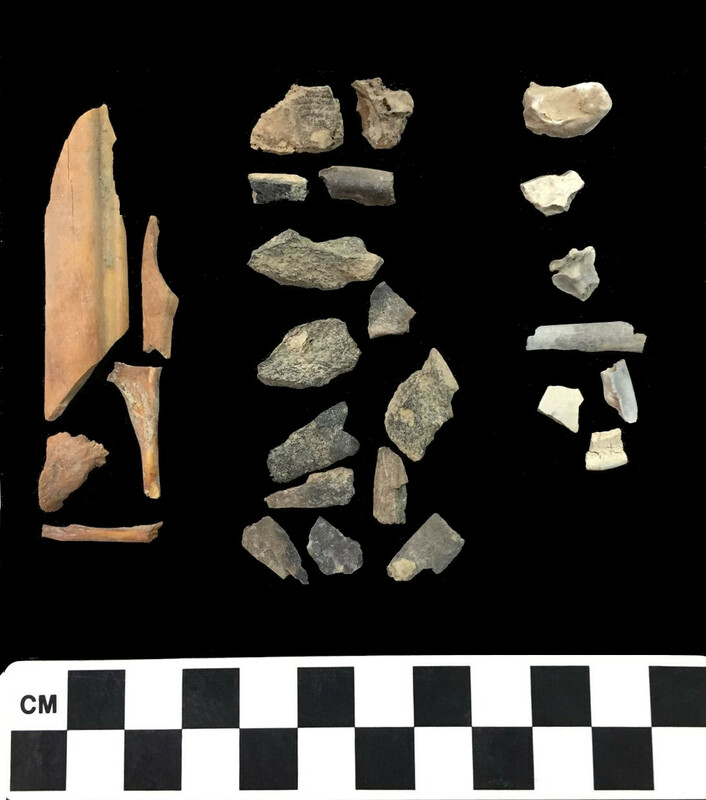 For example, at Modoc Rock Shelter burned bones were described as burned red, black, differentially burned (e.g., burned on one end only), and calcined (heavily burned to a white or gray color). Heavily burned bones (black or calcined) may have been thrown into fires to dispose of food refuse. Heavy burning destroys bones so we calculated the proportion of bones that were heavily burned as another way to look at destruction of bone. Modoc Rock Shelter had more heavily burned bones than did Koster. However, even the heavily burned bones at Modoc are well preserved. Archaic Period peoples removed tines on white-tailed deer antler using a cut and snap technique. They cut part way around the antler and then snapped the tine off. Image taken by Bonnie Styles. Bone and shell were important raw materials for making tools and ornaments. We record any evidence for human modifications of bone and/or wear resulting from use of bone as tools or ornaments. Archaic Period people shaped bones using techniques such as cutting and snapping, whittling, grinding, polishing, drilling, and incising or engraving. Use of bones as tools left signs of wear such as polish and damage. We look at modification and wear to try to determine how the object was used. 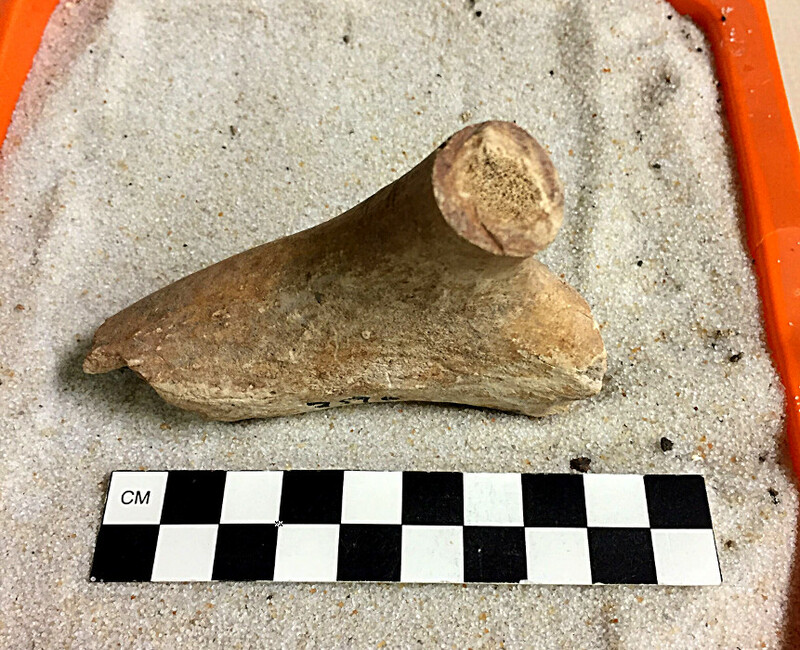 Archaic Period people shaped this white-tailed deer antler tine from Modoc Rock Shelter to make a more pronounced point on the distal end likely using whittling with a chert knife and grinding. You can see long vertical striations on the tine. They may have been making a spear point or tool for flaking stone tools. Image taken by Bonnie Styles. The white tailed-deer metatarsal from the comparative collection (right) gives you a sense of how Archaic Period people shaped the bone to create the deer metatarsal tool from Modoc Rock Shelter (left). Through cutting and grinding they shaped a sharp a tool with a sharp point. They may have used these pointed implements as awls and perforators. Image taken by Bonnie Styles. They also made ornamental objects such as bone pins and shell beads. They shaped and incised bone to make pins with distinctive designs. At Modoc Rock Shelter, they drilled freshwater mussel shells and drilled and ground aquatic gastropod (snail) shells to make pendants and beads. They also drilled and used the natural interior structures of aquatic snail shells to make and string beads. Marine shell beads provide evidence for exchange or transport of marine shells from the east coast. We will discuss bone and shell ornaments and tools in the section on Human Use of Animals.